I installed Solus Budgie in VirtualBox 5.12.2 using the Solus Budgie ISO from the website. Install and reboot worked fine. Software updated showed several hundred updates available, I updated, then restarted. On restart when the GUI login loads the video display is messed up. The system is not locked up, I can log in actually, but the video display is just all janky. Some people like myself might be interested in trying Solus in a VM before switching. VirtualBox is a pretty popular VM tool, it's components are used in other VM implementations. 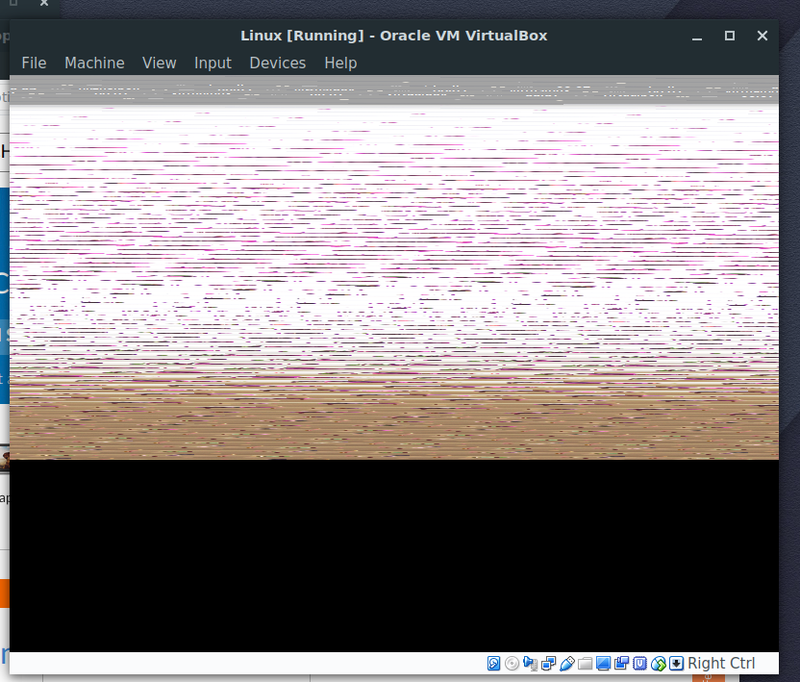 It might be worth looking to see if a video driver update is breaking Solus in VirtualBox. Here is my .vbox file for examination. sirredbeard removed a project: Lacks Project. sirredbeard added a project: Triage Team. Solus repository information is up-to-date. Package spidermonkey is not available in repositories. Package libimobiledevice is already at the latest release 5. Package npth is already at the latest release 3. Package fftw is already at the latest release 7. Package dejavu-fonts-ttf is already at the latest release 4. Package libnl is already at the latest release 3. Package dosfstools is already at the latest release 8. Package inotify-tools is already at the latest release 2. Package ntfs-3g is already at the latest release 10. Package font-droid-ttf is already at the latest release 6. Package openconnect is already at the latest release 4. Package grub2 is already at the latest release 18. Package libvdpau is already at the latest release 8. Package pcaudiolib is already at the latest release 3. Package xcb-util-renderutil is already at the latest release 2. Package xcb-util-wm is already at the latest release 3. Package xauth is already at the latest release 3. Package libedit is already at the latest release 2. Package libwpg is already at the latest release 1. Package kbd is already at the latest release 2. Package gpart is already at the latest release 1. Package mythes is already at the latest release 1. Package libpaper is already at the latest release 3. Package squashfs-tools is already at the latest release 6. Package lzo is already at the latest release 3. Package reiserfsprogs is already at the latest release 2. Package vpnc is already at the latest release 3. Package xdpyinfo is already at the latest release 3. Package font-lateef-ttf is already at the latest release 1. Package uchardet is already at the latest release 1. Package font-indic-ttf is already at the latest release 1. Package sbc is already at the latest release 1. Package gutenprint is already at the latest release 3. Package orc is already at the latest release 5. Package libgpod is already at the latest release 1. Package xmodmap is already at the latest release 5. Package isl is already at the latest release 1. Package librest is already at the latest release 7. Package gpm is already at the latest release 2. Package docbook-xml is already at the latest release 7. Package python-pycurl is already at the latest release 5. Package libplist is already at the latest release 6. Package xcb-util-image is already at the latest release 2. Package groff is already at the latest release 2. Package tree is already at the latest release 2. Package liblangtag is already at the latest release 1. Package libcroco is already at the latest release 8. Package libspectre is already at the latest release 2. Package which is already at the latest release 3. Package pixman is already at the latest release 10. Package wireless-tools is already at the latest release 3. Package libcddb is already at the latest release 1. Package cups-pk-helper is already at the latest release 4. Package gcab is already at the latest release 2. Package xrandr is already at the latest release 4. Package libmwaw is already at the latest release 4. Package xinit is already at the latest release 4. Package python-urlgrabber is already at the latest release 5. Package popt is already at the latest release 6. Package python-magic is already at the latest release 3. Package cpio is already at the latest release 10. Package bash-completion is already at the latest release 11. Package libnotify is already at the latest release 5. Package dotconf is already at the latest release 1. Package comar-api is already at the latest release 5. Package xdg-user-dirs-gtk is already at the latest release 4. Package libodfgen is already at the latest release 1. Package libaio is already at the latest release 2. Package piksemel is already at the latest release 2. Package cyrus-sasl is already at the latest release 7. Package libnettle is already at the latest release 15. Package libgnome-menus is already at the latest release 10. Package libxkbcommon is already at the latest release 5. Package libcap2 is already at the latest release 6. Package hyphen is already at the latest release 1. Package sound-theme-freedesktop is already at the latest release 2. Package libssh2 is already at the latest release 5. Package font-tlwg-ttf is already at the latest release 1. Package cracklib is already at the latest release 6. Package procps-ng is already at the latest release 6. Package graphite2 is already at the latest release 4. Package libmad is already at the latest release 3. Package libselinux is already at the latest release 1. Package fdk-aac is already at the latest release 1. Package goofiboot is already at the latest release 3. Package libsecret is already at the latest release 11. Package twolame is already at the latest release 2. Package font-roboto-ttf is already at the latest release 4. Package pinentry is already at the latest release 5. Package openldap is already at the latest release 5. Package comar is already at the latest release 5. Package liblcms2 is already at the latest release 7. Package libgtkmm-2 is already at the latest release 6. Package alsa-firmware is already at the latest release 3. Package neon is already at the latest release 3. Package libdmx is already at the latest release 7. Package python-pyliblzma is already at the latest release 2. Package vo-aacenc is already at the latest release 1. Package libusbmuxd is already at the latest release 2. Package swig is already at the latest release 3. Package espeak-ng is already at the latest release 2. Package cogl is already at the latest release 13. Package ijs is already at the latest release 1. Package setxkbmap is already at the latest release 3. Package libssh is already at the latest release 3. Package psmisc is already at the latest release 1. Package bc is already at the latest release 5. Package libsigc++ is already at the latest release 8. Package xcb-util-keysyms is already at the latest release 2. Package stoken is already at the latest release 2. Package disktype is already at the latest release 4. Package opus is already at the latest release 7. Package nghttp2 is already at the latest release 2. Package libshout is already at the latest release 2. Package libtheora is already at the latest release 5. Package libieee1284 is already at the latest release 2. Package libndp is already at the latest release 3. Package libdmapsharing is already at the latest release 1. Package libtool is already at the latest release 8. Package readline is already at the latest release 5. Package mobile-broadband-provider-info is already at the latest release 3. Package coinmp is already at the latest release 2. Package libksba is already at the latest release 5. There are extra packages due to dependencies. Switch to tty1 then back to tty7 and you should see the desktop. If not just log in on tty1. sirredbeard closed this task as Resolved. 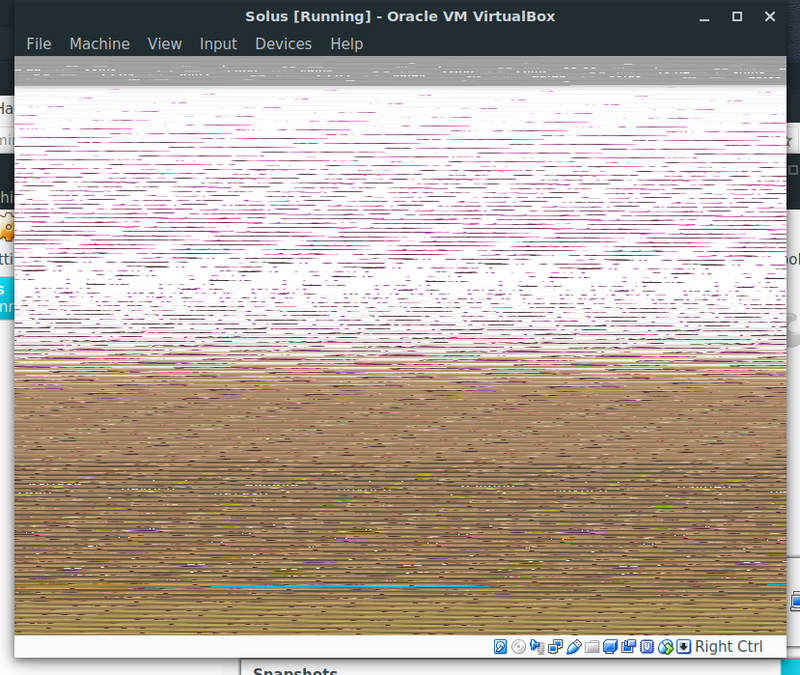 Or on reboot switching to tty1 as recommended above and then installing virtualbox-guest-current fixes this issue.